Looking to make salted caramel brownies without having to make your own caramel? 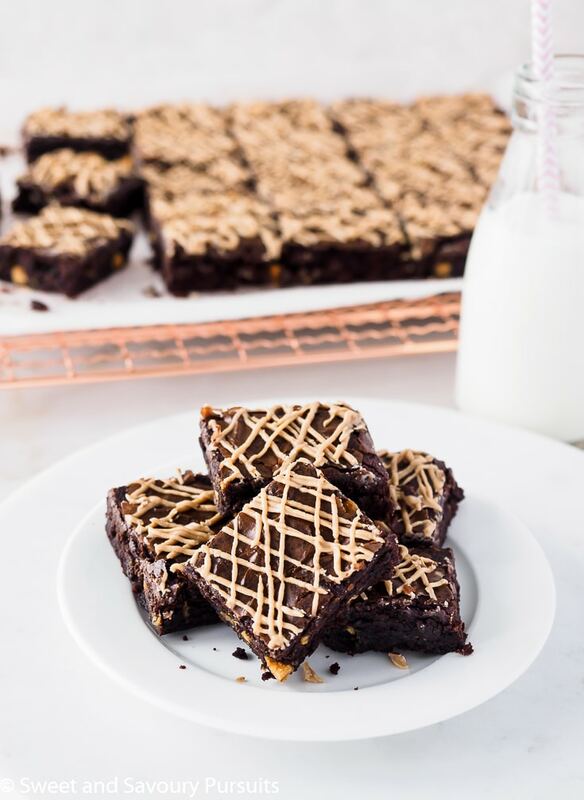 These rich and fudgy Salted Caramel Chip Brownies are made with salted caramel baking chips — a simple way to achieve that sweet and salty taste without the added work of making your own salted caramel. Deeply chocolaty, moist, chewy and fudgy, these Salted Caramel Chip Brownies make a delicious decadent treat that will satisfy the most serious of chocolate cravings. This is an easy recipe using simple ingredients that are easily substituted if needed. For instance, you can make these sweet and salty caramel brownies with either natural or Dutch processed cocoa. Though this recipes uses both brown and regular sugar, you can just use granulated sugar. And if you really want to make these brownies but don’t have caramel chips in your pantry, you can use semisweet chocolate chips in their place. Of course, you’ll loose the sweet and salty caramelness (that’s a word right?) of this recipe but the brownies would still be scrumptious. By the way, you’ll need a 13 x 9 baking tray for this brownie recipe. A tray of that size will give you at least 24 good sized portions. So if you would like to freeze some to enjoy later, you can pack these brownies in between wax paper in a freezable container and freeze for up to 3 months. Enjoy! Looking to make salted caramel brownies without having to make your own caramel? These rich and fudgy Salted Caramel Chip Brownies are made with salted caramel chips — a simple way to achieve that sweet and salty taste without the added work of making your own salted caramel. Lightly grease the bottom and sides of a 13x9-inch baking pan, line it with parchment paper letting it hang over the two longer sides (this will make it easier to lift the brownies out of the pan, and cut them). In a small saucepan, over medium-low heat, melt unsalted butter and chocolate chips. Let cool slightly. To a medium bowl, add the melted butter mixture, brown and granulated sugars, eggs and vanilla extract. Stir until combined. Add the flour, cocoa, salt and caramel chips. Mix with a spatula until well combined. Spread the batter into the baking pan and bake for approximately 22 to 24 minutes. Check brownies by inserting a toothpick in the centre of the pan, there should be a few crumbs clinging to the toothpick. Because ovens vary, it's a good idea to check your brownies a couple of minutes before the indicated time to make sure you don't over bake them. Remove brownies from oven and place on wire rack. Let cool in pan before lifting out brownies and cutting. Melt sea salt caramel chips in a microwave safe bowl in 20 seconds increments at 50% power, stirring caramel in between increments. Repeat until melted. Pour the caramel into a pastry bag, cut the tip off and drizzle caramel over baked brownies. That looks gorgeous.. Chocolate brownies drizzled with salted caramel.. Just the word itself sounds delicious.. I am going to try this one.. Thanks Steven, hope you love them as much as my family does! I am literally drooling right now! These look amazingly delicious and it looks like I may need to try them later this week. Thanks Leslie! These were a big hit, my daughter loves the sweet and salty combo and she thought these were the best! I hope you give them a try! Thanks Amanda, they were really good, didn’t take us long to eat them!